The gauntlet being thrown down got me to hit the start button, but then Titan Souls got even cockier and took away the minions so I just had to fight bosses. The Titans themselves are some of my favorite puzzles of the year, and beat me the hell down. I wasn’t frustrated though because I just wanted to hug the game and call the Titans, Colossuses, before throwing them in my pocket forever as my new buddies. In between beatdowns, I was surprised to find how immersive this pixel world really was. 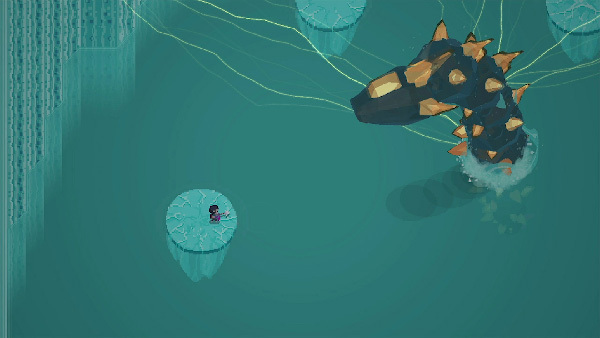 This could have very easily been a single gimmick game, but there’s a lot of heart to Titan Souls that ties everything together from its soundtrack down to the nuanced controls of firing the single arrow. Thanks for not taking it easy on me, Titan Souls. I wouldn’t have it any other way.